What has been the most important advancement in surgical sutures? There are several advances in surgical sutures that have had a huge impact on wound healing and recovery after surgical procedures. The sterilization processes for the sutures as well the antibacterial coatings used on some products greatly reduce the chance for tissue inflammation or the possibility of infection at the surgical site. Nonabsorbable sutures also provide additional support for wounds that in areas that experience a lot of stress and movement such as the cardiovascular system, joint surgeries and abdominal surgeries. For patients undergoing these procedures the uniform tensile strength of the surgical sutures that provides continued and consistent wound support is a major advancement to promote effective healing without complications. Why are there so many different types of surgical sutures and is there one product that is considered superior for all types of surgical applications? While historically there have been few options in surgical sutures, typically plant based suture material gave way to the use of catgut, then silk and eventually synthetics. Each of these materials, with the exception of plant based fibers, are now routinely used in various medical procedures in most hospitals, clinics and medical settings. Typically the more specialized the facility is the greater the range of surgical sutures available. Often the simplest and most versatile types of suture materials are found in less advanced types of settings including hospitals and treatment facilities in lower income areas including developing countries. Since sutures have been designed to enhance different features for specialized applications, there is really no one best product for all jobs. 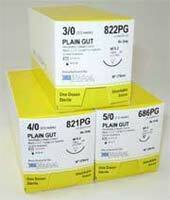 Typically for most practices a good choice is a suture material that is recommended for general soft tissue ligation and approximation which can include the nonabsorbable poly based sutures as well as the absorbable catguts and synthetics. Nonabsorbable sutures, including prolene, polyester, nylon and silk can be good options for wound closure that requires long term wound support for optimum healing. Is there an advantage in buying needled surgical sutures over suture on the reel? In many different practices there are advantages to both the needled surgical sutures that come sterilized and packaged and the option to buy suture on a ligating reel. The obvious benefit to needled and sterilized options is that there is no work required to prepare the equipment and surgical suture material prior to the procedure. The package is simply opened in a sterile environment and following sterile procedures. The surgeon is then able to select the needle style, size and type, the length of suture and the diameter of suture based on the specific protocols for the procedure. For small surgeries or emergency rooms this is often an ideal time and labor saving options. For specialized surgeons and larger surgical units it may be more cost effective to consider the ligating reels for suture material. This will allow the use of specific amounts of suture material that can be customized for each procedure. Since there is constant use of the suture material there is less chance of issues with keeping the product sterile and using in sterile environments.